Ever feel like there’s nothing you can do about saving the planet? Fear not, there is, and your dog will go wild over it! 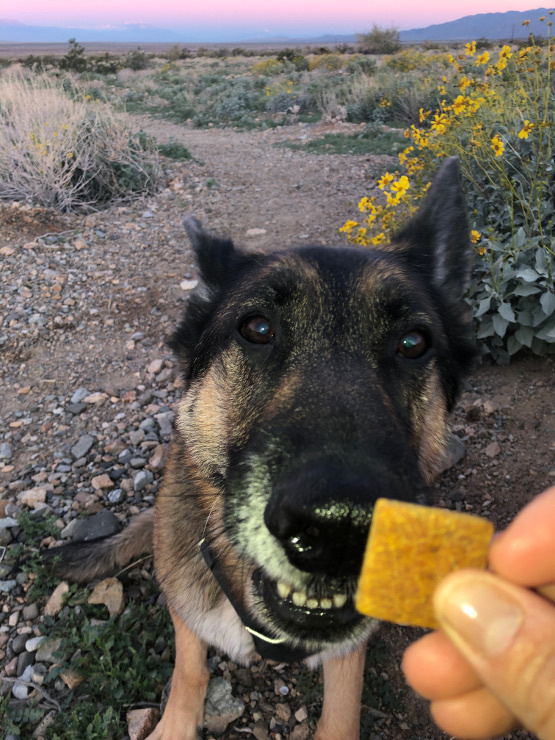 A brand new flavor of meat-free pet food treats by Wild Earth Pets is making a difference for the environment, one yummy bite at a time. BOGO Wild Earth Meat-Free Pet Food Treats This Week Only! We love how Wild Earth Pets is breaking new ground in the development of meat-free pet food. They’re not just another animal-based pet food company that’s draining earth’s precious resources. Wild Earth is charting a new course to show us that when it comes to feeding dogs, cats (and even ourselves), good protein can come from plants, not other animals. 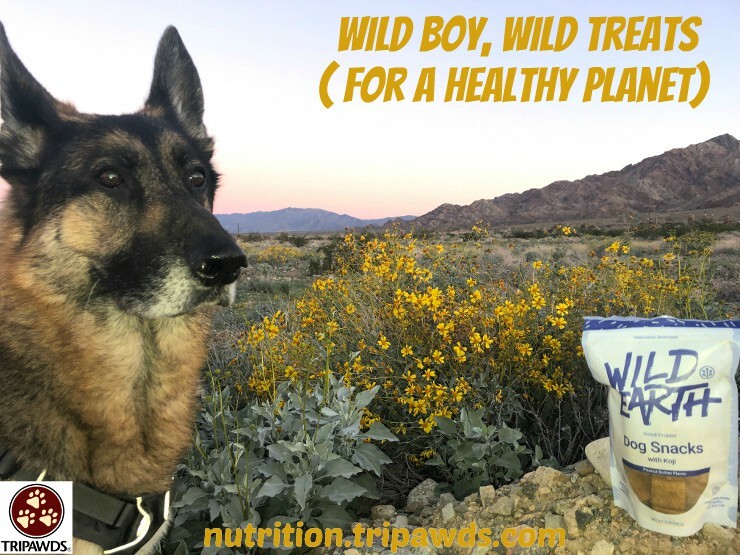 Tripawds Spokesdog Wyatt Ray loves their original good protein treats. Wild Earth sent him a complimentary bag and it’s almost gone. We can’t wait to see what he thinks about their new Banana Cinnamon flavor. Why is Wild Earth making meat-free pet food treats? Because our pet’s impact on the planet is huge. Dogs and cats are responsible for about 25–30% of the environmental impacts from animal production (this includes the impact on land, water, fossil fuel, phosphate, and biocides). Reducing our reliance on animal products gets us one step closer to a healthier planet for everypawdy. 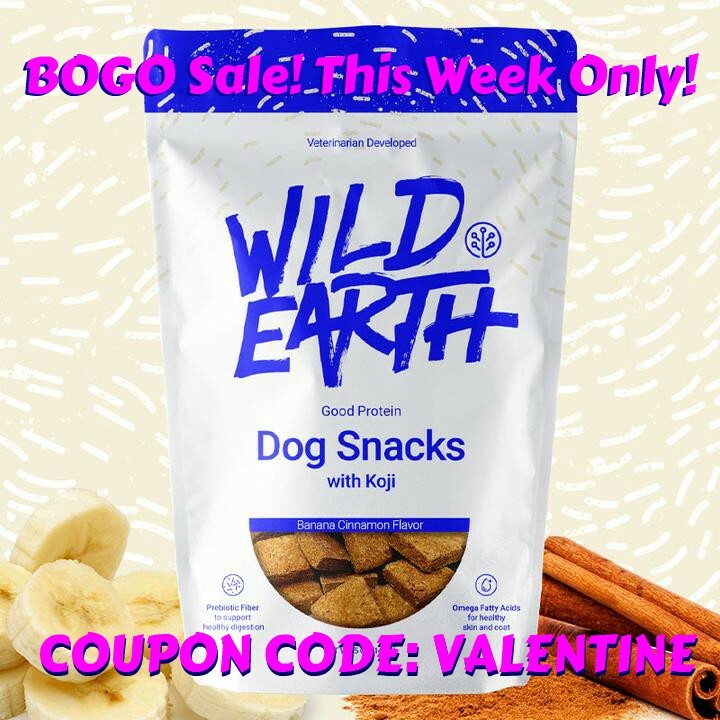 BOGO Wild Earth Meat-Free Treats, This Week Only! New Banana Cinnamon Flavors Rock Wyatt’s World! Wild Earth’s plant-based cultured meat and cultured protein products for dogs (and eventually cats) offer nutrition and taste that’s just as great if not better than animal meat products. An entire line of meat-free pet food will soon follow Wild Earth’s Good Protein Treats. This month, Wild Earth launched their second flavor of treats, Banana Cinnamon. Join the celebration with a special buy one get one free promo all the way until Februrary 14, 11:30 pm PST! Simply click the image below or use the code VALENTINE at checkout. Interesting statistic on how much the environment is impacted just from the dog and cat food industry. Sweet! Glad to hear they have happy bellies!